I have developed a year-round curriculum of lessons perfect for preschool classes in nurseries. I can incorporate dancing and games, story time and songs. I have developed a range of 42 Songs and Nursery Rhymes that take the children through counting, body parts, emotions and many other topics in a fun way. I encourage the children to express themselves and learn a second language and have lots of fun together. 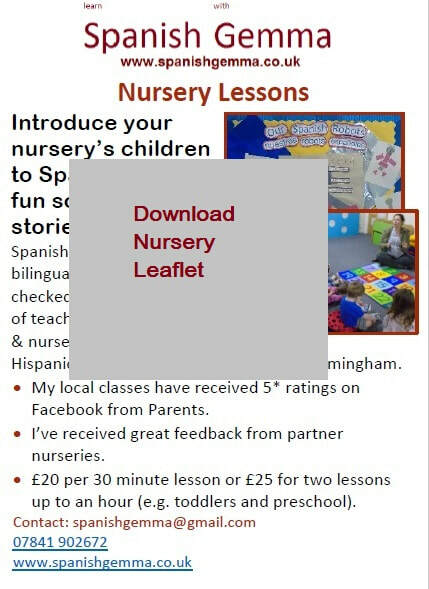 "Banana Moon Kings Norton and Banana Moon Northfield are visited weekly by Gemma for Spanish Singing Fun. All our children and staff love the session and we have all learnt our favourite nursery rhymes in Spanish. Gemma makes the learning experience fun and gives the children the time to learn and join in. We all look forward to our Thursdays with Gemma. The sessions are fun, Educational and encourages children to learn about their wider environment. We would recommend Gemma highly to any nursery or individual who would love their child/ children to learn another language." Nursery Manager Banana Moon Nurseries Kings Norton/Northfield.